Basic finance refers to that branch of economics which is more focused in the allocation and management of resources and in both acquisition and investment. In the simplest terms, basic finance is a topic which involves matters linked to the financial markets and money. If you want to become an expert in finance, then you should know how important enrolling in a basic finance skills certification course is when it comes to improving your awareness in this specific field of study. Enrolling in this certification course is a major help in your attempt to become an expert in financing and in fully understanding all the basic concepts and principles used in the finance industry. When attempting to hone your basic finance skills, note that finance is a subject which can be divided in three major categories namely personal finance, public finance and corporate finance. Personal finance involves decisions linked to paying for education, buying insurance such as property and health insurance, saving for retirement and financing durable goods including cars and real estate. Public finance refers to finance when linked to sub-national entities such as provinces, states, municipalities and countries, sovereign states and any other related public entities including school districts. Public financing is more focused on identifying the needed expenditure of a public sector, sources of its revenue, the process of budgeting and issuing debts for projects designed for the public. Corporate finance refers to the process of providing funds for the activities of a corporation and involves balancing profitability and risk while ensuring that the wealth of the corporation is greatly maximized. Improving your background about basic financing is now possible with the help of the basic finance skills certification course offered by Brainmeasures. The basic finance skills course from Brainmeasures is highly recommended to anyone who wishes to improve his knowledge about basic finance because of the comprehensiveness of the course. Enrolling in this online certification course can definitely help you improve your knowledge about both accounting and finance while also gathering information about the key areas linked to personal financial planning, corporate financial planning and public financial planning. 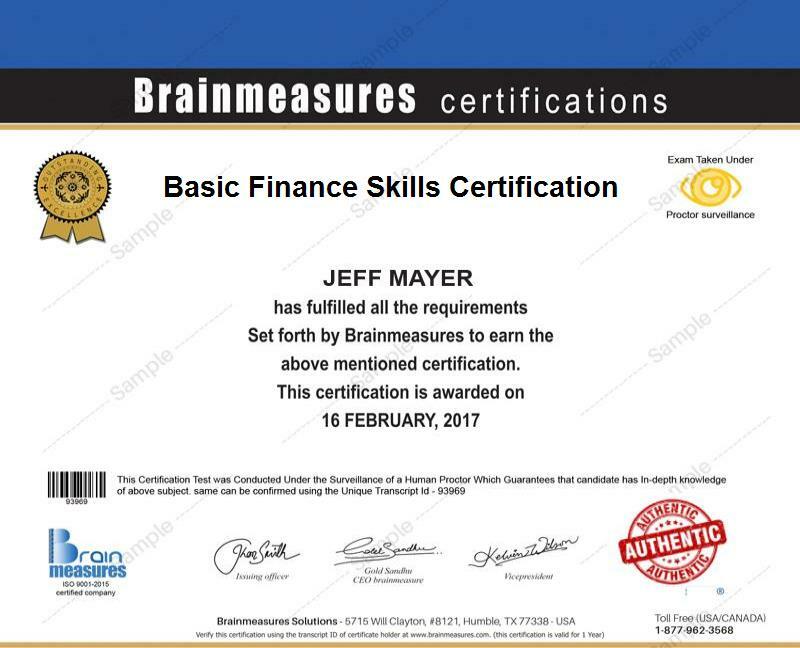 This program from Brainmeasures also comes with a basic finance exam and it is extremely important for you to pass this test as this will allow you to acquire your certificate. It is no longer undeniable that the comprehensive and detailed nature of the basic finance skills certification program is the major reason why it continues to benefit different types of individuals and professionals. This certification course is primarily intended for professionals in an organization especially those who are involved in making capital budgeting or financial decisions while also interpreting and using financial data. The basic finance skills certification course can also benefit anyone who wishes to gather enough knowledge about long-term life cycle financing. Completing a basic finance skills certification course can also help you get the kind of salary that you have dreamed of receiving. It is because the salary for basic finance skills certification holders is considered to be above average. You can actually expect your average annual salary to be $68,000 and you can expect this to grow through the bonuses and other remuneration benefits provided by the company where you are working.